Are you tired of feeling ashamed every time you creep into the Young Adult section of BookPeople? Well, the Forever Young Adult Book Club is here to offer you relief! We're a group of adults (technically) who meet at 5 PM the second Sunday of every month. This month’s book is Life: An Exploded Diagram by Mal Peet, so leave your shame at the door, grab a cocktail, and join us! The location of the meeting changes, so please email foreveryoungadult@gmail.com to learn more. Mal Peet grew up in North Norfolk, and studied English and American Studies at the University of Warwick. 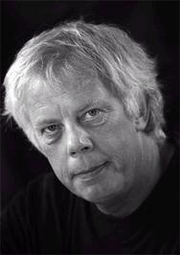 Later he moved to south west England and worked at a variety of jobs before turning full-time to writing and illustrating in the early 1990s. With his wife, Elspeth Graham, he has written and illustrated many educational picture books for young children, and his cartoons have appeared in a number of magazines. He and Elspeth live in Exmouth, Devon. He is the author of several novels for young adults. His first, Keeper, was published in 2003, and won the Branford Boase Award. His second, Tamar (2005), the story of two men caught up in secret operations during World War II, won the 2005 Carnegie medal. His third novel, The Penalty (2006), returns to the South American location of Keeper, and sets a modern-day story of crime and corruption against an historical narrative of slavery and occult religion. It was shortlisted for the 2007 Booktrust Teenage Prize. His latest novel is Exposure (2008), a modern re-telling of Othello and winner of the 2009 Guardian Children's Fiction Prize. Mal Peet is currently considered a "single author." If one or more works are by a distinct, homonymous authors, go ahead and split the author. Mal Peet is composed of 2 names. You can examine and separate out names.